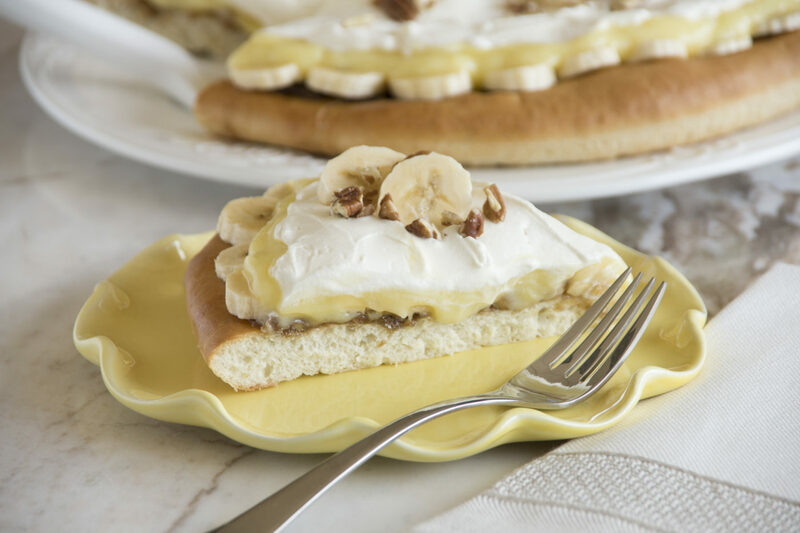 This variation of banana cream pie is so good and easy and is always a crowd pleaser. Press rolls together and roll dough into a 13-inch circle. Place on a 12-inch sprayed pizza pan. Turn up edges of dough to form a ridge. Let rise 10 minutes. Combine brown sugar, butter, and pecans. Sprinkle evenly over crust. Bake at 350°F 20 minutes. Watch for air bubbles and poke down if needed. Remove from oven. Cool crust completely. Arrange bananas on crust. Spoon prepared pudding over bananas. Top with whipped topping. Garnish with bananas and pecans, if desired.